Interesante el artículo Improving web accessibility: a study of webmaster perceptions, publicado en el año 2004. Large percentages of web sites continue to be inaccessible to people with disabilities. Since tools and guidelines are available to help designers and webmasters in making their web sites accessible, it is unclear why so many sites continue to be inaccessible. In this paper, we present the “Web Accessibility Integration Model,” which highlights the multiple points within web development where accessibility can be incorporated or forgotten. It is uncertain why webmasters do not use the various tools and guidelines that currently are available for making web sites accessible. A survey was created, and data was collected from 175 webmasters, indicating their knowledge on the topic of web accessibility and the reasons for their actions related to web accessibility. Findings and future directions for research are discussed. The world wide web provides a wealth of information, and the user population of the web is diverse, including users of all ages, educational levels, and levels of computing experience (Shneiderman, 2000). Many users of the web have various types of disabilities. These disabilities include sensory (e.g. hearing and vision), motor (e.g. limited use of hands) and cognitive (e.g. learning disabilities) impairments. These users with disabilities use various forms of assistive technology to allow them to browse web sites. Assistive technologies include hardware and software such as screen readers, voice recognition, alternative pointing devices, alternate keyboards, and refreshable Braille displays (Paciello, 2000). Users with disabilities can only utilize a web site if it is designed to be compatible with the various assistive technologies. A web site that is sufficiently flexible to be used by all of these assistive technologies is called an accessible web site (Slatin & Rush, 2003). An accessible web site is very similar to an accessible building. An accessible building offers curb cuts, ramps, and elevators to allow a person with disabilities to enter and navigate through the building with ease. 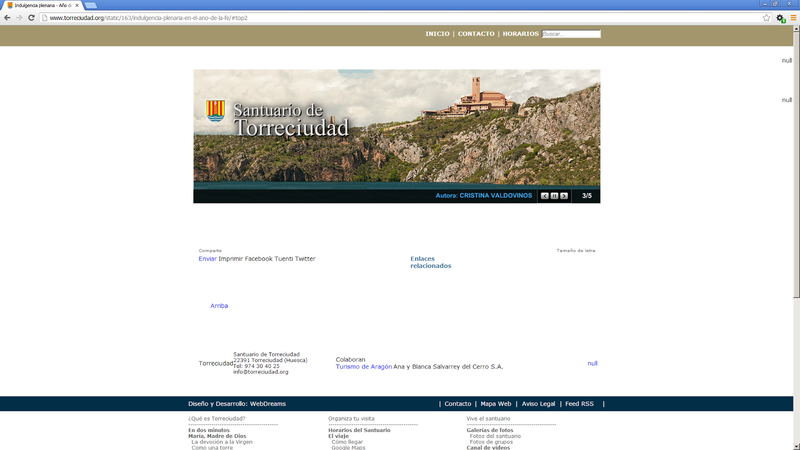 An accessible web site offers similar functionality. Accessibility is not just a high-level theoretical goal. Currently, there are guidelines that web developers can follow so that their web sites can be accessible. For instance, the Web Accessibility Initiative provides guidelines, called the Web Content Accessibility Guidelines (WCAG) to help developers make their web sites accessible (http://www.w3.org/wai). 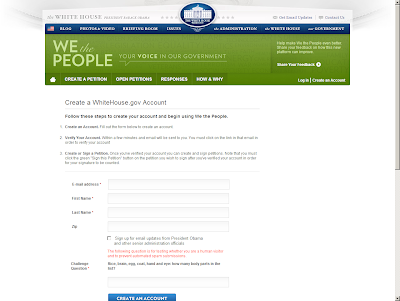 The United States Government offers similar guidelines to web developers, which are included in the Section 508 initiative (http://www.section508.gov). A copy of the Section 508 guidelines is included in Appendix A. In addition, automated software tools are available to help find accessibility flaws in web sites before the sites are publicly posted. These software tools include Bobby, RAMP, InFocus, and A-Prompt (Ivory, Mankoff, & Le, 2003). 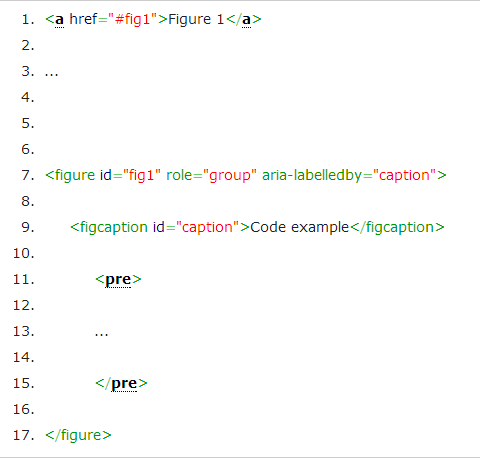 In addition, new versions of web development tools (such as DreamWeaver and FrontPage) include tools that assist developers with accessibility-related issues. Given that the guidelines and tools are there, it seems hopeful that most web sites would be accessible. 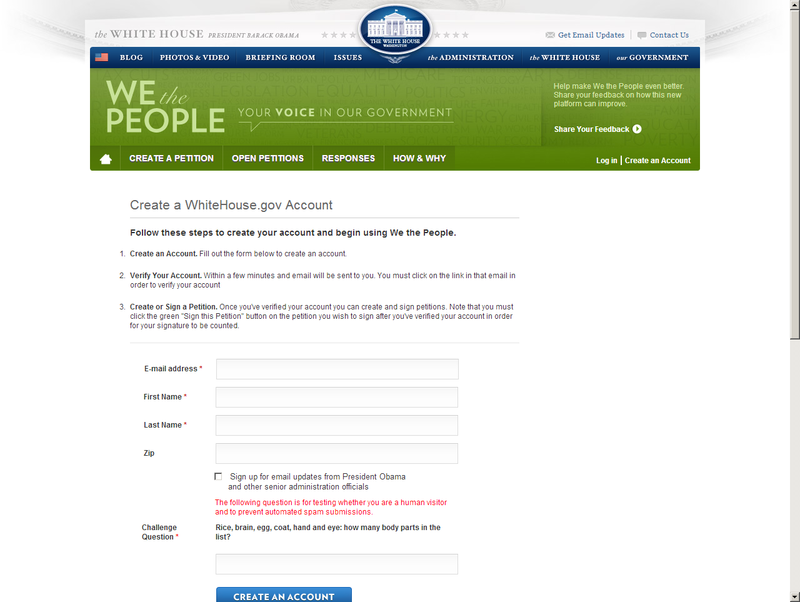 In fact, many governments make web accessibility a requirement for government information on the web. The United States, England, Canada, Portugal, and Australia require some types of government information to be accessible (Slatin & Rush, 2003). Unfortunately, most web sites are not currently accessible. Recent studies point out that large percentages (70–98%, depending on the category of site) of web sites are not accessible. For instance, in recent studies, private and non-profit web sites (Lazar, Beere, Greenidge, & Nagappa, 2003), for-profit commerce web sites (Sullivan & Matson, 2000), US state web sites (Ceaparu & Shneiderman, 2002), and even US Federal web sites (Stowers, 2002) were found to have major accessibility problems. In addition, over time, web sites are getting more inaccessible (Lazar & Greenidge, in preparation), as accessibility violations have been added to sites. Web sites need to be accessible to all users, including those with disabilities. Given all of the resources available for making web sites accessible, it is unclear why they remain so inaccessible. Our goal is to learn more about why sites are not accessible. Since the person that has the greatest influence on currently-existing web sites is the webmaster, the researchers decided to start the investigation with webmasters. The researchers created a survey to learn more about webmasters and their perceptions and knowledge on the topic of web accessibility. The results of that survey are discussed in this paper. In addition, we have created a model, called the Web Accessibility Integration Model, which describes the various ways that accessibility flaws enter a web site. Our goal with this research is to increase the knowledge about why web sites are not accessible, so that we can make the web a more accessible place. Web accessibility es un vídeo de menos de una hora de duración en la que se recoge una conferencia que se impartió en Vanderbilt University en enero de 2011. El artículo 5 HTML5 and ARIA design patterns explica cinco formas de usar HTML5 con ARIA. Estos patrones pueden parecer un poco repetitivos, puede parecer que se está diciendo lo mismo dos veces... así es, desgraciadamente no todos los lectores de pantalla actuales ofrecen el mismo soporte de HTML5 y ARIA, así que por ahora "hay que decir lo mismo dos veces". El artículo The blind community's fight for a more accessible Web, publicado en The Daily Dot, me ha sorprendido porque señala que todavía hay gente que piensa que las personas con discapacidad no utilizan la Web. The Internet is as critical to these individuals as it is for anyone else—if not more so, since the Web is often used to avoid the challenges and transit that accompanies daily activities like shopping. Blind for as long as he can remember, Olsen has been able to trace the progress of online accessibility since the Internet went mainstream in the mid-90s. He received his first computer at the age of 8. Back then, the only way for him to "surf the ‘net" was to copy and paste text into a speech program. "The technology is there," he said. "The battle has been getting websites to comply." Lazar said most companies that fail to provide accessible websites are acting from a place of ignorance. In his experience, he said many companies just assume they don't have blind or otherwise impaired customers using their website. He said that's a mistaken belief, since many blind people have used websites to better plan trips to retail locations or avoid the hassle of going to stores altogether. Es de hace unos meses, pero es una buena referencia: Accessible HTML5 Media Players and More. Is there existing legislation in your country to encourage or ensure that websites, in particular government, public service or other sites providing widespread services of general use (such as hiring services, travel, telephony, energy, education, employment, leisure...) are accessible to visually impaired people? Please be sure to specify in your answer to which categories of site the regulation(s) apply. What are the standards that are used in your country to measure website accessibility? Is there an authority in place to establish, measure and control website accessibility? Y así hasta 9 preguntas. These guidelines also make Web content more usable by older individuals with changing abilities due to aging and often improve usability for users in general. Estas pautas también hacen que el contenido web sea más fácil de usar por las personas mayores con capacidades que cambian debido al envejecimiento y muchas veces mejoran la usabilidad para todos los usuarios en general. 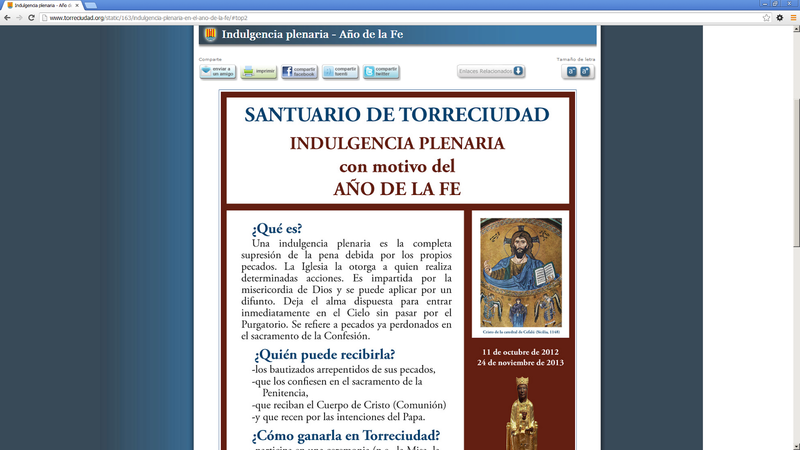 No conocía el concepto de indulgencia plenaria de la iglesia católica, es un buen método para ir directo al Cielo sin pasar por el Purgatorio. Pero si eres ciego, lo vas a tener un poco difícil: alguien te lo tendrá que explicar. 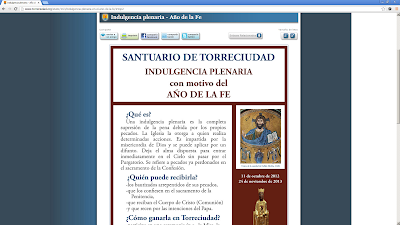 En el sitio web del Santuario de Torreciudad hay una página web en la que explican cómo obtener la indulgencia plenaria. Pero esta página tiene un grave problema: la explicación que se ofrece está en una imagen, que no tiene ni texto alternativo ni descripción larga. Consecuencia: si eres ciego, antes tendrás que pasar por el Purgatorio. 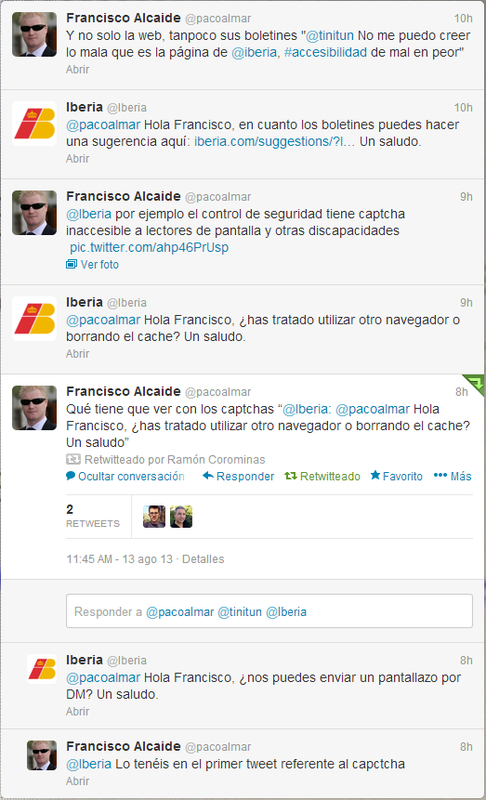 Y no solo la web, tanpoco sus boletines "@tinitun No me puedo creer lo mala que es la página de @iberia, #accesibilidad de mal en peor"
@pacoalmar Hola Francisco, en cuanto los boletines puedes hacer una sugerencia aquí: http://www.iberia.com/suggestions/?language=es … Un saludo. 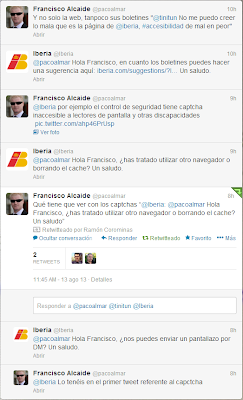 @pacoalmar Hola Francisco, ¿has tratado utilizar otro navegador o borrando el cache? Un saludo. @pacoalmar Hola Francisco, ¿nos puedes enviar un pantallazo por DM? Un saludo. De pequeño pensaba que la lengua de signos era universal, se usaba la misma en todo el mundo. Pero no es así, la situación es similar a lo que ocurre con las lenguas orales: la gente tiene la manía de querer tener su propia lengua (¡castigo divino!). Ahora he descubierto que existe la lengua de signos internacional, International Sign, una versión simplificada de la lengua de signos que tiene el objetivo de que sea fácil de entender. Pero como suele ocurrir (¡castigo divino! ), no existe una, sino que existen tres variantes de esta lengua. Por cierto, en la página del World Report on Disability de la Organización Mundial de la Salud podemos ver unos vídeos en los que se emplea esta lengua. Mar González me pasa un enlace a una entrada de su blog donde habla de la lengua internacional de signos: La lengua de signos universal no existe: el sistema internacional de signos. Los landmark roles de Accessible Rich Internet Applications (WAI-ARIA) 1.0 son regiones especiales de una página web que se definen para que el usuario pueda navegar fácilmente entre ellas. Aunque es una característica que mejora la accesibilidad web, su empleo puede mejorar la usabilidad y, por tanto, puede ser beneficioso para todos los usuarios. Algunos tienen un equivalente en las etiquetas HTML, como aside, nav o la nueva etiqueta main, mientras que otros no (Using WAI-ARIA Landmarks – 2013). ¿Pero qué pasa con los usuarios que no necesitan y no usan un lector de pantallas, como por ejemplo los usuarios que manejan el ordenador con el teclado? Estos usuarios también se pueden beneficiar de los landmark roles, pero desgraciadamente, los navegadores actuales no proporcionan ningún mecanismo para su uso. Sin embargo, en el caso de Mozilla Firefox, existe una extensión que resuelve el problema: Enabling landmark-based keyboard navigation in Firefox. Siempre me sorprende la capacidad que tiene la administración pública para hacer lo que le da la gana. En vez de dar ejemplo, son los primeros que se saltan sus propias normas. Supongo que aplican eso de "Juan Palomo, yo me lo guiso, yo me lo como". 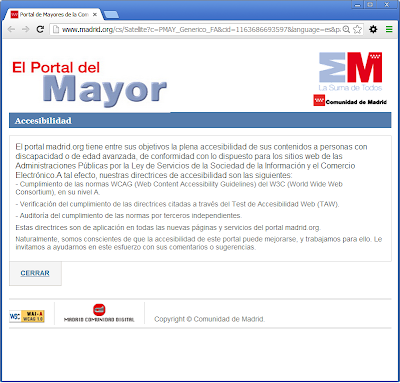 Hace referencia a la Ley de Servicios de la Sociedad de la Información y el Comercio Electrónico. Esa ley, la Ley 34 del año 2002, ha sido "superada" por otras leyes posteriores. En el año 2011, el Gobierno de los Estados Unidos inauguró el sitio web We the people para que la gente pudiera realizar peticiones a su gobierno. Las peticiones tienen que alcanzar un mínimo de firmas para que sean contestadas por el gobierno. Algunas de las peticiones realizadas hasta ahora tienen su sentido (por ejemplo, un mayor control de las armas), mientras que hay otras que son ridículas (construir la Estrella de la Muerte de Star Wars, construir la USS Enterprise de Star Trek). En el artículo The dumb reason blind Americans can't sign a petition supporting their rights nos cuentan que en la casa blanca la cagaron. 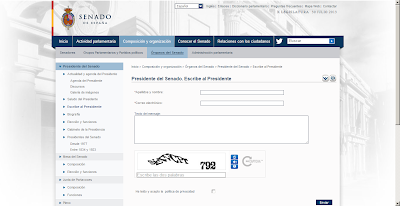 El formulario para realizar una petición tenía un captcha visual, y la alternativa sonora era prácticamente ininteligible. ¿La Casa Blanca arregló su cagada? Claro, allí intentan limpiar su mierda, mientras que aquí dejan que huela. 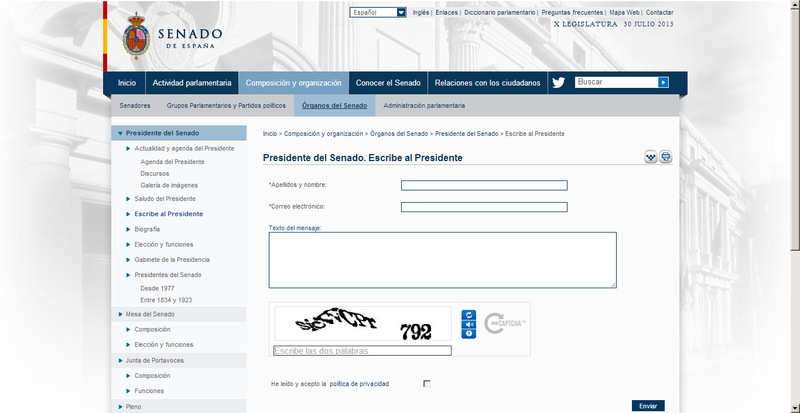 Como se puede ver en la siguiente imagen, el captcha visual y sonoro lo cambiaron por un captcha lógico en el que se hacen varias preguntas. Este tipo de captcha presenta un problema importante, la barrera del idioma, pero en este caso en el que el formulario es para realizar una petición que hay que redactar en inglés, no plantea ningún problema. Black, jelly and yellow: how many colours in the list? Eye, glove, white, cake, prison and prison: how many colours in the list? Gracias a Álvaro, un lector de este blog, me ha llegado esta noticia: El modelo español como paradigma en la futura legislación europea sobre accesibilidad de los Sitios Web. Hace unos meses comenté que la Unión Europea está preparando una directiva para regular la accesibilidad de los sitios web de los organismos públicos. Desde la Comisión europea la visión es distinta y exponen la situación que se encuentran ante realidades diversas que se corresponden con 25 Estados miembros. Uno de los problemas hace referencia al incumplimiento de las normas, como expone Sanmartín: "Nosotros nos hemos dado cuenta, según una serie de estudios, que se puede tener una legislación vigente y eso no garantiza que el nivel de accesibilidad se cumpla. Los últimos datos que manejamos dicen que en España la legislación puede estar muy bien redactada pero los datos de cumplimiento están en torno a un 60 por ciento de accesibilidad en las páginas web del sector público, lo cual hace pensar que hay un trabajo por hacer, y nosotros queremos que esos porcentajes se incrementen. En ese sentido nuestra idea ha sido reducir un poco el alcance para maximizar el cumplimiento". Hace unos pocos días, el 23 de julio, el Departamento de Justicia de los Estados Unidos publicó una nota de prensa en el que se informaba del acuerdo alcanzado con Louisiana Tech University a raíz de una denuncia presentada por un alumno ciego que no podía acceder a los materiales de su curso porque no eran accesibles. 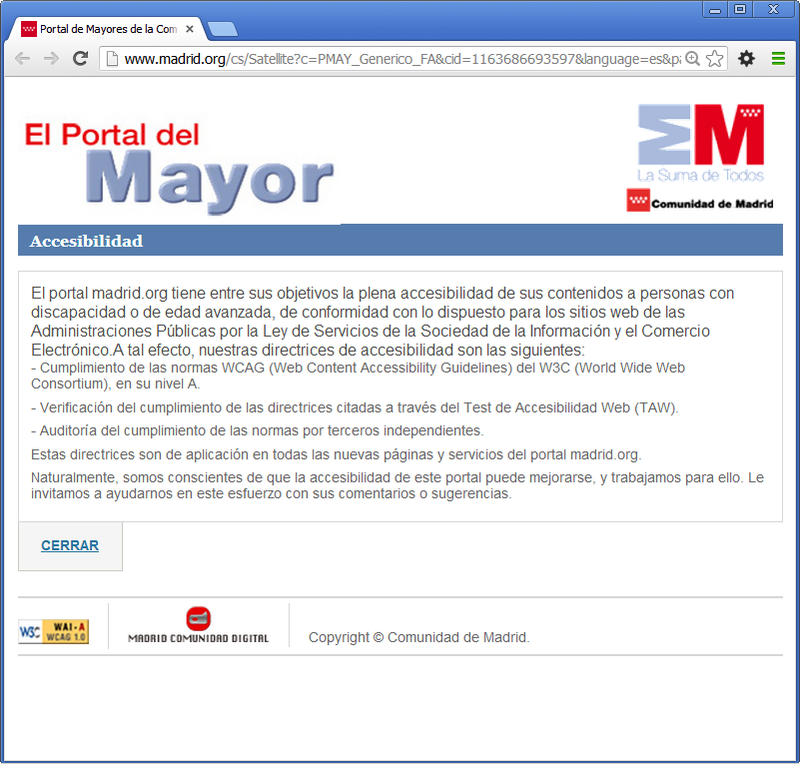 El problema estaba en el uso de una plataforma de aprendizaje en línea (e-learning) llamada MyOMLab que tenía problemas de accesibilidad. En el acuerdo alcanzado, la universidad se compromete a revisar sus políticas en materia de accesibilidad, se compromete a cumplir el nivel AA de WCAG 2.0 en todas las páginas y materiales publicados a partir del año 2010. Además, la universidad formará a sus profesores y administrativos para que sepan crear documentos accesibles y tendrá que pagar al alumno $23.543 en concepto de daños.